“These birds become at once so abundant, that it would be more difficult not to meet one, than to observe a dozen or more, during a morning walk. Their motions are as animated as their music. They pass from twig to twig, upwards or downwards, examining every opening bud and leaf, and securing an insect or a larva at every leap. Their flight is short, light, and easy. 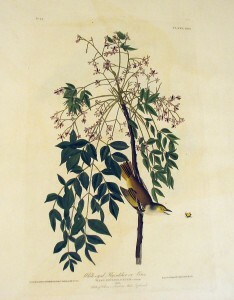 Their migrations are performed during the day, and by passing from one low bush to another, for these birds seldom ascend to the tops of even moderately tall trees. Like all our other visitors, they move eastward as the season opens, and do not reach the Middle States before the end of April, or the beginning of May. Notwithstanding this apparently slow progress, they reach and disperse over a vast expanse of country. I have met with some in every part of the United States which I have visited. –J. 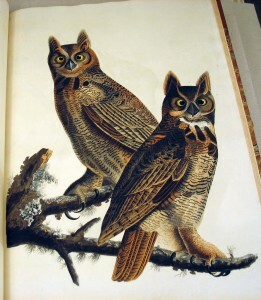 J. Audubon, Ornithological Biography, I (1831), 328-329 [excerpted]. Tonight we hosted Jack Dougherty’s EDUC 300 course entitled Education Reform: Past & Present. 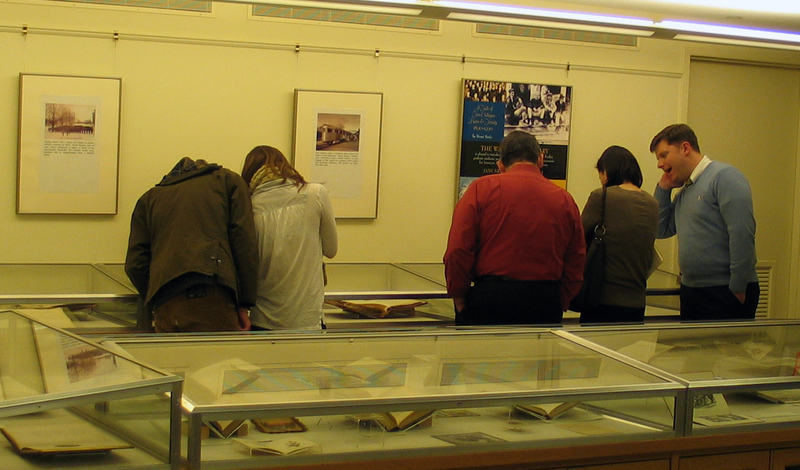 The students spent an hour or so examining an array of titles from the Henry Barnard collection. Among those the students used were McGuffey’s readers and spellers from the 1850s; geographies by Jesse Olney from the 1840s and ’50s, and those of David Camp and Joseph Colton of the 1860s and ’70s; Samuel Goodrich’s The young American; or, Book of government and law (1842); and several readers for both young men and women form the 1840s and ’50s. As is often the case, more interesting conversations come from pairing the students up with a book and giving them a list of questions to answer, rather than standing in front of them and talking for an hour. Comments Off on Old textbooks used again! Despite the snow this evening, we had a gratifying turnout for the opening of our two graduate student exhibitions: the first on Trinity and Bates College ca. 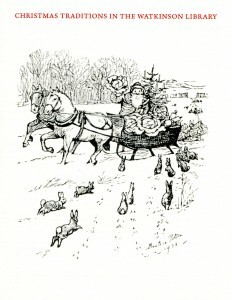 1890-1930, and the second on Christmas traditions represented in the Watkinson. This exhibition (and the two printed catalogs which accompany it) were part of the requirements which the students fulfilled in American Studies 835: Museum & Library Exhibitions. Brent Bette, a history teacher at Simsbury High School who is currently completing an M.A. 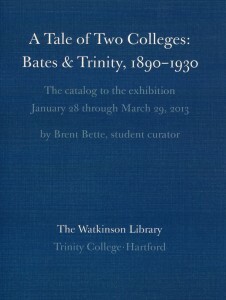 in American Studies at Trinity, discussed his exhibition comparing Trinity and Bates Colleges. 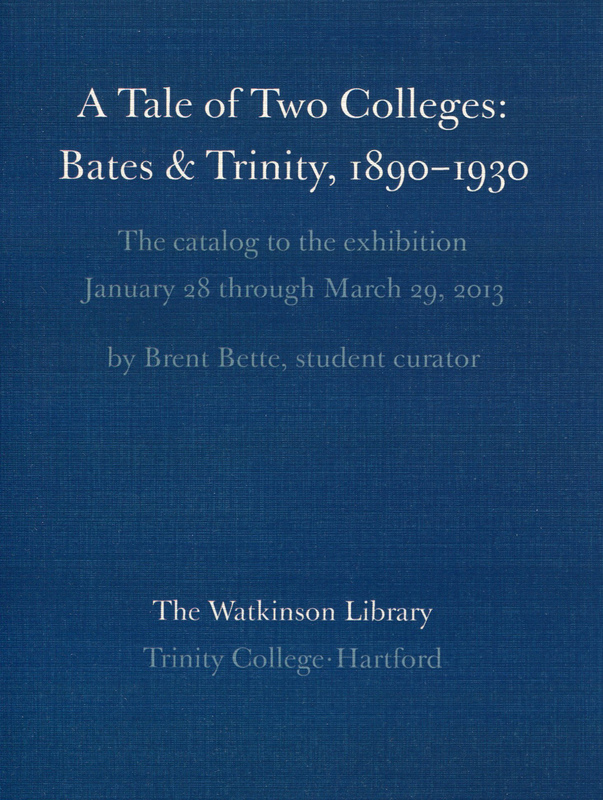 Bette is a graduate of Bates, and has been collecting ephemera relating to his alma mater since graduation. His items are placed along side those he selected for comparison from the Trinity College Archives. Jenn Brasfield, also in the American Studies M.A. 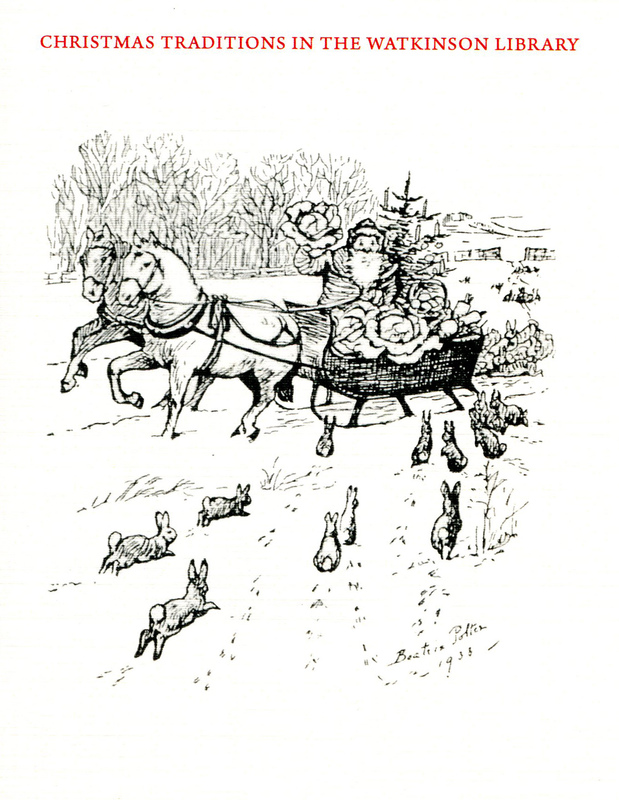 program, was inspired to put up a Christmas-themed exhibition when she discovered that the Watkinson held an array of British and American Christmas cards dating back to the mid-19th century. The catalogs (covers below) were written by the students, designed by Michael Russem of Kat Ran Press (Cambridge, MA), and printed at Trinity College. Comments Off on Student Exhibitions! “The Passenger Pigeon, or, as it is usually named in America, the Wild Pigeon, moves with extreme rapidity, propelling itself by quickly repeated flaps of the wings, which it brings more or less near to the body, according to the degree of velocity which is required . . . The multitudes of Wild Pigeons in our woods are astonishing . . . In the autumn of 1813, I left my house at Henderson, on the banks of the Ohio, on my way to Louisville. In passing over the Barrens a few miles beyond Hardensburgh, I observed the Pigeons flying from north-east to south-west, in greater numbers than I thought I had ever seen them before, and feeling an inclination to count the flocks that might pass within the reach of my eye in one hour, I dismounted, seated myself on an eminence, and began to mark with my pencil, making a dot for every flock that passed. In a short time finding the task which I had undertaken impracticable, as the birds poured in in countless multitudes, I rose, and counting the dots then put down, found that 163 had been made in twenty-one minutes. I travelled on, and still met more the farther I proceeded. The air was literally filled with Pigeons; the light of noon-day was obscured as by an eclipse, the dung fell in spots, not unlike melting flakes of snow; and the continued buzz of wings had a tendency to lull my senses to repose. Whilst waiting for dinner at YOUNG’S inn at the confluence of Salt river with the Ohio, I saw, at my leisure, immense legions still going by, with a front reaching far beyond the Ohio on the west, and the beech-wood forests directly on the east of me. Not a single bird alighted; for not a nut or acorn was that year to be seen in the neighbourhood. They consequently flew so high, that different trials to reach them with a capital rifle proved ineffectual; nor did the reports disturb them in the least. I cannot describe to you the extreme beauty of their aerial evolutions, when a Hawk chanced to press upon the rear of a flock. At once, like a torrent, and with a noise like thunder, they rushed into a compact mass, pressing upon each other towards the centre. In these almost solid masses, they darted forward in undulating and angular lines, descended and swept close over the earth with inconceivable velocity, mounted perpendicularly so as to resemble a vast column, and, when high, were seen wheeling and twisting within their continued lines, which then resembled the coils of a gigantic serpent. –J. 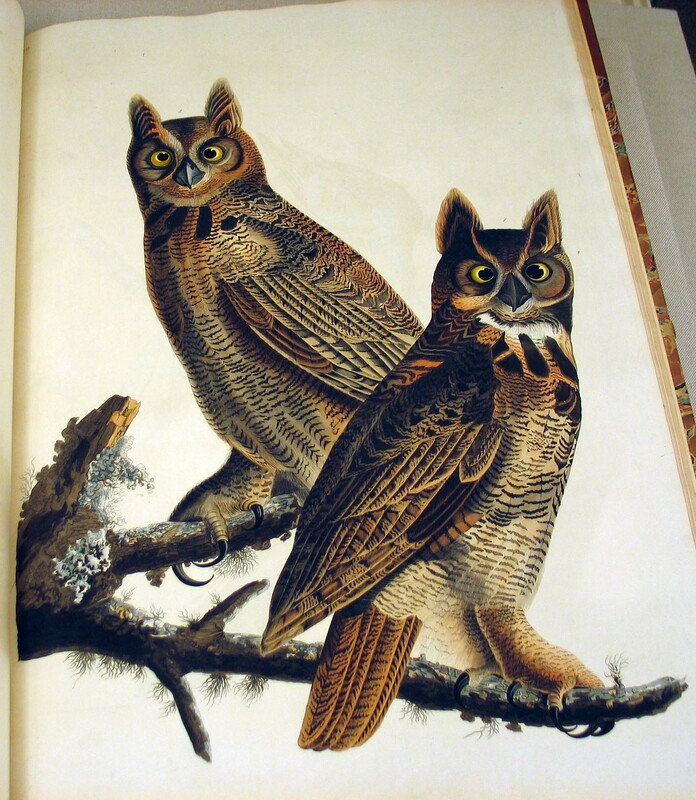 J. Audubon, Ornithological Biography, I (1831), 319-321 [excerpted]. –J. 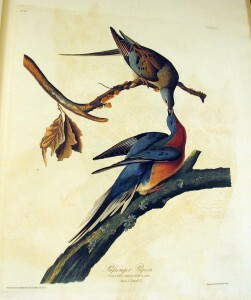 J. Audubon, Ornithological Biography, I (1831), 313-314 [excerpted]. You are currently browsing the The Bibliophile's Lair blog archives for January, 2013.